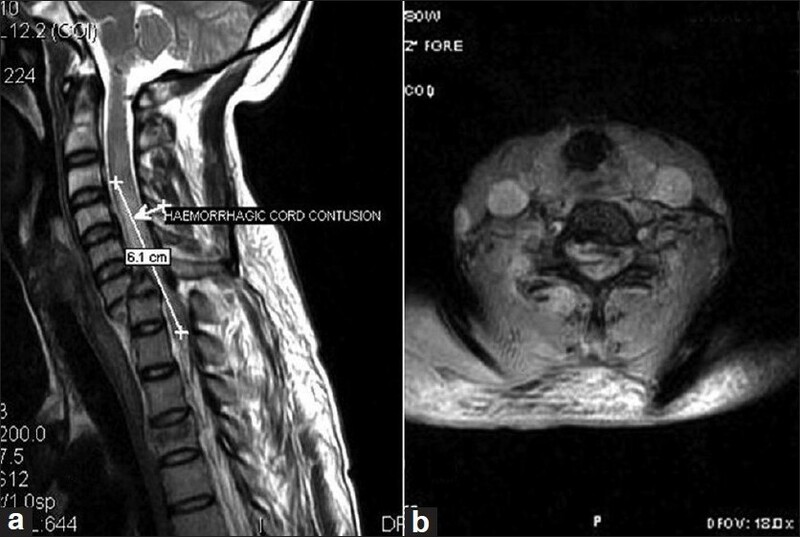 We report here a rare case of high cervical stenosis at the level of atlas who presented with progressively deteriorating quadriparesis and respiratory distress. 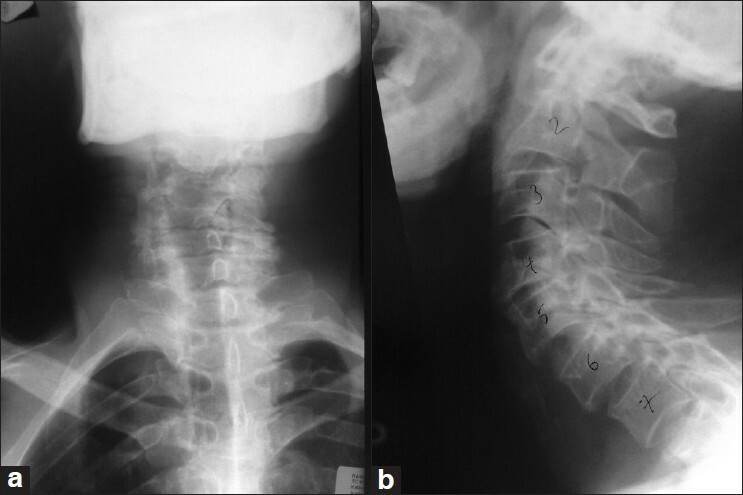 A 10-year-old boy presented with above symptoms of one-year duration with a preceding history of trivial trauma prior to onset of such symptoms. Cervical spine MRI revealed a significant stenosis at the level of atlas from the posterior side with a syrinx extending above and below. 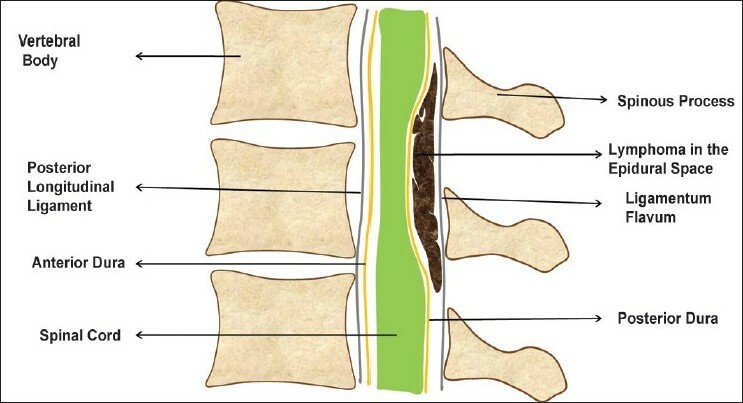 High-resolution computed tomography of the above level yielded an ill-defined osseous bar compressing the canal at the level of C 1 posterior arch, which appeared bifid in the midline. The patient was immediately taken up for surgery in view of his respiratory complaints. The child showed an excellent recovery after excision of the posterior arch of atlas and removal of the compressing osseous structure. Anterior odontoid screw fixation or posterior C1-2 fusion techniques are routinely used in the treatment of Type II odontoid fractures, but these techniques may be inadequate in some types of odontoid fractures. In this new technique (Kotil technique), through a posterior bilateral approach, transarticular screw fixation was performed at the non-dominant vertebral artery (VA) side and posterior transodontoid fixation technique was performed at the dominant VA side. C1-2 complex fusion was aimed with unilateral transarticular fixation and odontoid fixation with posterior transodontoid screw fixation. 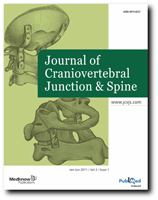 Cervical spinal computed tomography (CT) of a 40-year-old male patient involved in a motor vehicle accident revealed an anteriorly dislocated Type II oblique dens fracture, not reducible by closed traction. Before the operation, the patient was found to have a dominant right VA with Doppler ultrasound. He was operated through a posterior approach. At first, transarticular screw fixation was performed at the non-dominant (left) side, and then fixation of the odontoid fracture was achieved by directing the contralateral screw (supplemental screw) medially and toward the apex. Cancellous autograft was scattered for fusion without the need for structural bone graft or wiring. 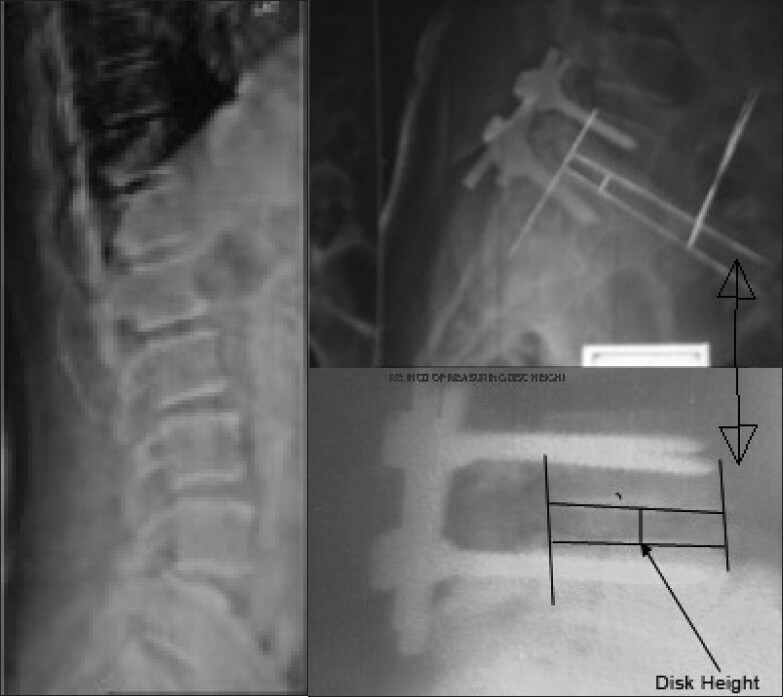 Postoperative cervical spinal CT of the patient revealed that stabilization was maintained with transarticular screw fixation and reduction and fixation of the odontoid process was achieved completely by posterior transodontoid screw fixation. The patient is at the sixth month of follow-up and complete fusion has developed. 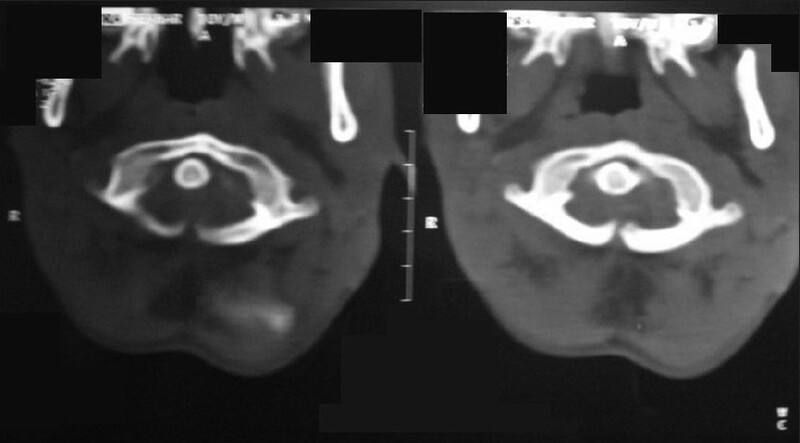 With this new surgical technique, C1-2 fusion is maintained with transarticular screw fixation and odontoid process is fixed by concomitant contralateral posterior transodontoid screw (supplemental screw) fixation; thus, this technique both stabilizes the C1-2 complex and fixes the odontoid process and the corpus in atypical odontoid fractures, appearing as an alternative new technique among the previously defined C1-C2 fixation techniques in eligible cases. 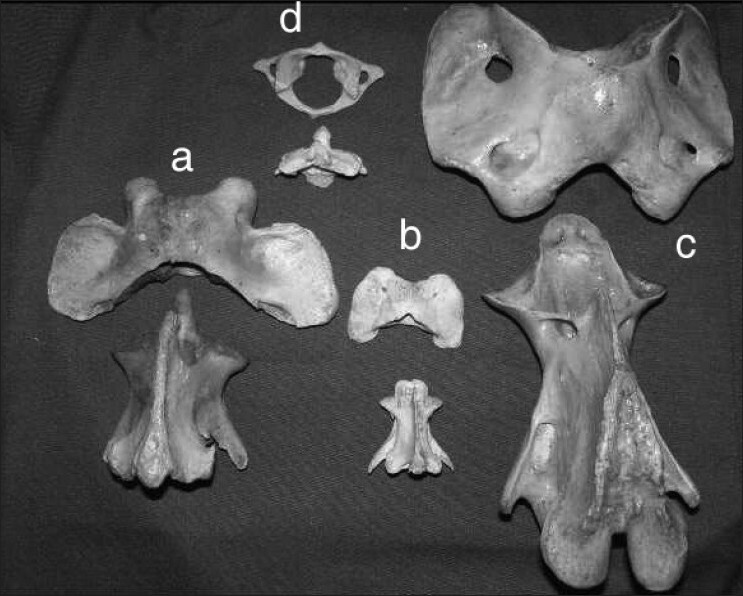 Enterogenous cysts account for 0.7-1.3% of spinal axis tumors. Cervical and thoracic segments are most often affected and they are rare in the lumbar region. Intramedullary variant which comprises less than 5% of enterogenous cysts are densely adherent to the surrounding tissue and preclude total excision. Partial excision is associated with recurrence and is the most common unfavorable outcome in these cysts. Hence, such patients need follow-up with serial imaging. We describe a case of conus medullaris enterogenous cyst presenting as lower limb pain. Due to dense adhesion of the cyst to the surrounding neural tissue, subtotal excision was done. The patient is symptom and tumor free at one year interval. We describe our case, discuss its uniqueness and review the literature on this rare but difficult to cure tumor.